Research aim: To analyse green space in Easton and Lawrence Hill and propose interventions to engage and encourage the community to unite and shape their own environment. In October 2016, four MArch year 1 students from the University of the West of England volunteered to work with community group Up Our Street to examine the sense of public ownership of open spaces within Easton and Lawrence Hill, Bristol. We characterised Lawrence Hill and Easton as a well-loved patchwork quilt. It is diverse, with different coloured and patterned patches that are tightly threaded. It does, however, have some tears that require stitching together and holes that need patching over. Over the course of approximately two months, we undertook an analysis exercise with a view to engaging with the communities in the area as to how they used open spaces in the neighbourhood and what they expected of the spaces. 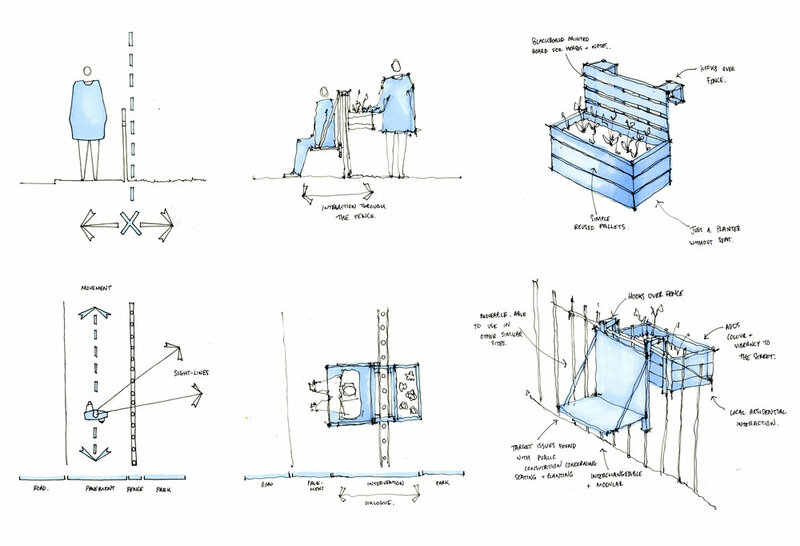 We proposed a three-stage approach to enliven under-utilised spaces and engage residents by first proposing quick plug-in furniture to brighten up Clark Street Open Space and generate interest in the project. Following on from this, we proposed the resident-led creation of a public garden utilising permanent, low-cost modular planters that could be easily funded and built by the community. Finally, we suggested spaces in the area where the project could expand to later by repeating stages one and two. Working with community groups and forming connections with organisations across Bristol, we envisaged that this project could become a template for community action across the city.